Hello, my magician friends around the world...The new issue of TGM - volume #4, issue #5 is ready for you to relish! Read the contents noted below and you are sure to run for it. 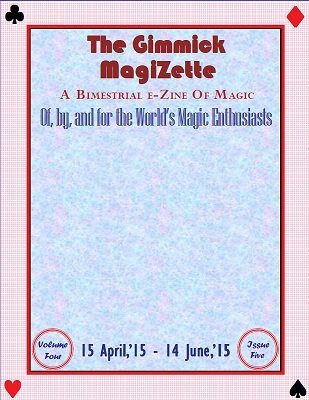 This issue is a staggering collection of articles, magic effects (I hate the word 'trick' - magicians do 'magic' whereas 'tricks' are done by the 'tricksters'), jokes, cartoons, news and views and much more. Solyl Says simple tittle-tattles of Solyl. However, here he talks on card capers. The Magic of Presentation by Sam Dalal is a must read article for neophytes and experienced alike. MagicIan Adair Column - a chit-chat and magic column by Ian Adair who knows his Art. Impromtu Objective Prediction By Aldo Colombini - whatever one gets from Aldo is pure gold. Some Ideas on Rope Cutting by Gautam Guha - miss this article and regret. Wandering Rabbits Plus by Fabian - a great children effect full of entertainment. The Trio - My 3 Paddle Tricks by Gora Datta - something novel and far-out. Good Bye! by Solyl Kundu - one may find it effective, audience tested magic, not an idea! How to create a spelling set-up - an inspiring idea one shouldn't miss. Miscellaneous section is full of meats - Photo Quiz, George Jhonstone cartoon, Broken wand, MagiCartoon, Please help - Information needed..an appeal, Magic Flash - Guess who by Ian Adair Plus News and Views give you some idea what is happening in this part of the world.